Marie Beuzeville Byles (1900–1979) was a key figure in the historical development of Buddhism in Australia, and the nation’s conservation movement. From the 1940s she began to develop an eco-Buddhist worldview and Buddhist environmental ethic that she applied in her day-to-day conservation activities and articulated over the course of four books on Buddhism and dozens of published articles. She is recognized in Australia for her Buddhist environmental thought, the influence that her ideas had in a key environmental debate of her day, and her international profile as a Buddhist. Most histories of modern eco- Buddhism, however, do not mention Byles’s work, and there has thus far been little scholarly analysis of her writings. 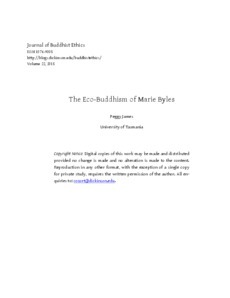 This paper examines Byles’s eco-Buddhist ideas and activities in detail, and assesses the historical significance of her contribution.